Head to any barbecue (or grigliata / cookout) in Italy and you’ll most likely encounter cooks utilizing extra virgin olive oil, a strong open flame, salt, protein, and lots of rosemary – this is Italian style grilling with no heavy barbecue sauces obscuring the high quality meat or fish)! 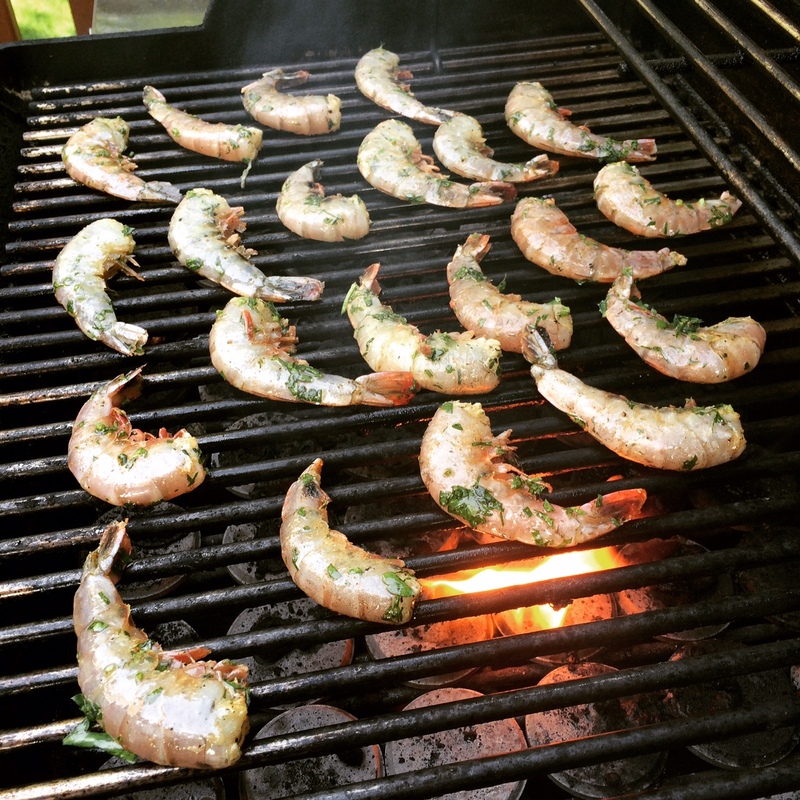 One of our favorite foods to grill is wild shrimp (preferably fully intact because they stay more flavorful) and our simple recipe includes parsley, rosemary, Kosher salt, freshly ground black pepper, and extra virgin olive oil. The best method to prepare your grilled shrimp with rosemary is to skewer the large shrimp or prawns with pieces of rosemary sprig; this way you’re sure to infuse the shrimp with a woody flavor without overwhelming the shrimp with rosemary flavor. We also recommend preparing a wood fire, if possible (one key “ingredient” is the smokey / woody flavor profile and that’s tough to achieve with a gas grill though you can see in the above picture we do use a gas grill for convenience here in the States). Finally, remember with Italian grilling simplicity is key; start with great meat or fish and include an herb or two, plenty of extra virgin olive, and salt. Wine is also essential as is sucking all that goodness out of the shrimp heads! Heat up a large grill. In a large bowl combine oil, salt, pepper, and diced parsley. Add shrimp and mix with hands. Skewer shrimp with rosemary branches. Grill each side for 4-5 minutes on high with grill with lid closed (add a few minutes to each side during the grilling process if your shrimp or prawns are very large).